Stretch Limo Hire, School Ball, Wedding, Corporate. 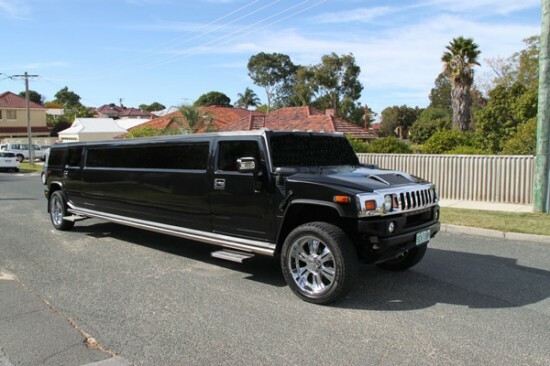 Stretch Hummer Limos Perth. Wedding, School Ball, Corporate, Promotions, Party, Hens Night, Girls Night Out, City & Winery Tours. Wicked Limos Perth offer you the ultimate in Stretch Limo Hire with their Super Stretch Pink and Black Stretch Hummer Limousines. Featuring the latest in on-board entertainment these 14 seater limousines are ideal for any Perth function where the WOW factor is a prerequisite. You and 13 of your classmates can make the entrance of a lifetime by fronting up to your School Ball in a Pink or Black Stretch Hummer Limo. The 2000 watt sound system, the multiple LCD screens and onboard dance floor can make the trip to your school ball that little bit more enjoyable. Imagine the entire Bridal Party being chauffeured to the church in the back of a 14 seat stretch limo with room to spare. Onboard bar and refreshments, multiple LCD screens and a state of the art sound system. The photo opportunities are endless and our fully trained chauffeur is on hand to cater to your every need. So, you want to paint the town? Lets start off with a 14 seat Stretch Limo Hire complete with Bar, Dance Floor, LCD’s, 2000 Watt Sound System and a professional chauffeur who knows Perth like the back of his hand. More often than not our corporate clients will require a limousine on short notice. That limousine must be spotless and the chauffeur has to be courteous, prompt and professional. That’s why so many Perth Corporate clients call us. We are always ready willing and able to provide stretch limo hire any time of the day or night. For more information, quotes, prices and bookings contact Perths leading Stretch Limo Hire experts on (0412) 956 936.